The foundation of the Parti Quebecois, the election of Pierre Elliot Trudeau and the month of May in France, the Prague Spring, the assassinations of Marthin Luther King and Robert F. Kennedy in the United States: 1968 – 50 years later takes a look back at the many events of this memorable year of the 20th century on a global scale. 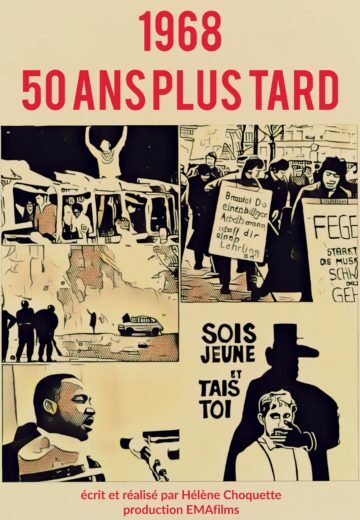 This documentary, in two parts, unites archives and interviews with more than a dozen figures, such as Robert Charlebois, Louise Forestier, Gilles Duceppe, Guy Rocher, Donald Cuccioletta, Paule Baillargeon and Alain Geismar, who remember the unique state of mind that reigned at the time, between student revolts, ideology debates and political crisis'. Broadcast by Société Radio-Canada on Tou.tv.